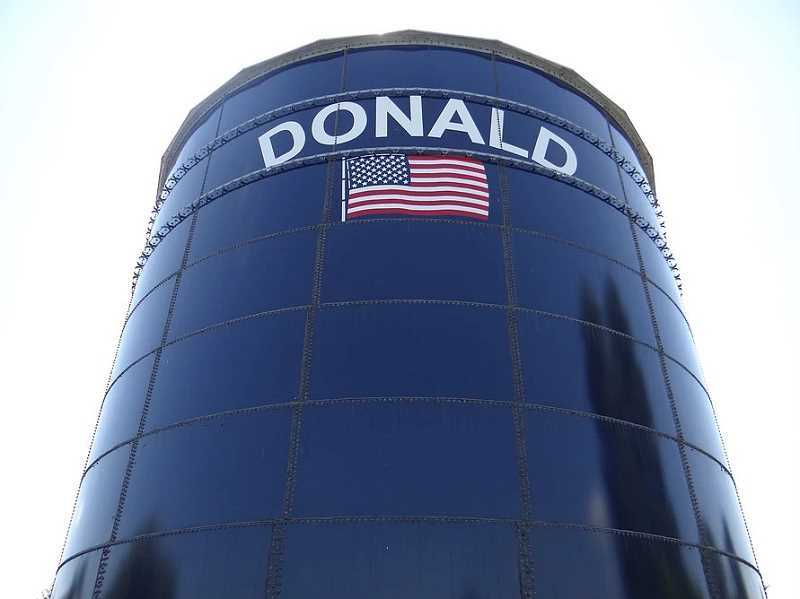 The city of Donald is low on water. So low that the city instituted mandatory conservation measures from Aug. 1 to Oct. 1. The problem is that city's reservoir levels are running low and have dropped an average of 1.3 feet, about 22,750 gallons, per day over the summer. Low water has been an issue in the past, but conservation was not necessary then, according to Donald City Manager Heidi Bell. "It has been an issue in the past, but we haven't had this many dry days," Bell said. "Combined with the fire danger we made the determination that we need the reservoir at max capacity just in case." Donald residents are being asked to limit use of water indoors and are prohibited from using city water to clean outdoor surfaces like sidewalks and driveways, from leaving water running from a hose, using more than 500 gallons to fill a swimming pool or hot tube, or otherwise using water in a way that causes runoff. The city has set Tuesdays, Thursdays, Saturdays and Sundays as water use days and the remainder of the week as no water use days. Allowed watering includes watering gardens and lawns before 9 a.m. and after 6 p.m. and topping off swimming pools. The goal of the city's conservation effort is to reduce water consumption by 85,000 gallons per day, from about 200,000 gallons per day to 115,000 gallons per day. The city has two wells, but only one is operating, and has to run continually around the clock. The city's second well has been out of operation for years and will need rehabilitation. In July the city's 350 residential connections used 3,116,000 gallons, about 82 percent of total consumption. Industrial connections used 532,000 gallons and commercial and public connections used 136,000 gallons. The city has two reservoirs, one with a capacity of 200,000 gallons and one with a capacity of 325,000 gallons. Donald's city engineer and a well consultant are looking over the city's water infrastructure and could have recommendations for the city in two weeks, Bell said. The reservoirs' levels have already begun to rise, a possible indication that residents are following conservation measures, Bell said. "In the grand scheme of city water problems, this one is probably not as terrible (as in other cities) but it could be bad if people keep using water at an extreme rate," Bell said. Donald residents can monitor the city's conservation efforts online at https://www.donaldoregon.gov/water-conservation. The webpage includes a chart of the water level at the city reservoirs, the city's goal is a height of 30 feet. The level was 20.4 feet on July 31 but had increased to 27.5 feet by Monday morning August 6.